The newly founded party seeking to dethrone the Sweden Democrats as the mouthpiece for right-wing beliefs is appealing to anti-immigrant voters by pledging mass deportations. Being the only one to suggest such a thing in the Nordic country, the party has seen a major influx of members in the past few weeks alone. Alternative for Sweden (AfS), which models itself as a "repatriation party" is determined to send as many immigrants as possible back to their respective home countries. This was explained by party leader Gustav Kasselstrand in an interview with the Swedish channel TV4. The interview was arranged in connection with the transition of Mikael Jansson, who in the decade from 1995-2005 led the Sweden Democrats, previously known as the most right-wing party in the country's political landscape, to AfS. Jansson said he fully subscribed to Alternative for Sweden's party program, which specifically includes the issue of repatriation. Jansson also called AfS's policy "clear and straightforward." When confronted by journalists about exactly how many were to be deported if AfS had its way, Jansson became hesitant, but was helped out by Kasselstrand. "It's hundreds of thousands at the very least," Gustav Kasselstrand, who stood next to Jansson, clarified to TV4. "You have to step back and look at the extreme immigration policy that Sweden had under [the governments of [Stefan] Löfven and [Fredrik] Reinfeldt. And then we will review all the residence permits and citizenships that have been distributed," Kasselstrand pledged. According to Kasselstrand, hundreds of thousands of people need to emigrate back home already in the near future. AfS has "vast ambitions" in this area, he said, promising more detailed figures later. Kasselstrand said it was "obvious" that the citizenship of people who have supported terrorist in the Middle East will have to be revoked in the first place. By his own admission, the perspective of these people becoming stateless or being expelled to Syria doesn't worry him much — unlike the Swedish government, which is known for its refusal to revoke citizenship even from the most hardened terrorists, having ambitions to "channel them back" into society. Criminals, people who have been granted residence in Sweden on false premises and beggars are other categories of people that will have to go, according to Kasselstrand. The AfS head ventured that there is a number of different groups who take advantage of the "naivety" of Swedish politicians and has pledged to go through "the whole package" of recent years' immigrants. 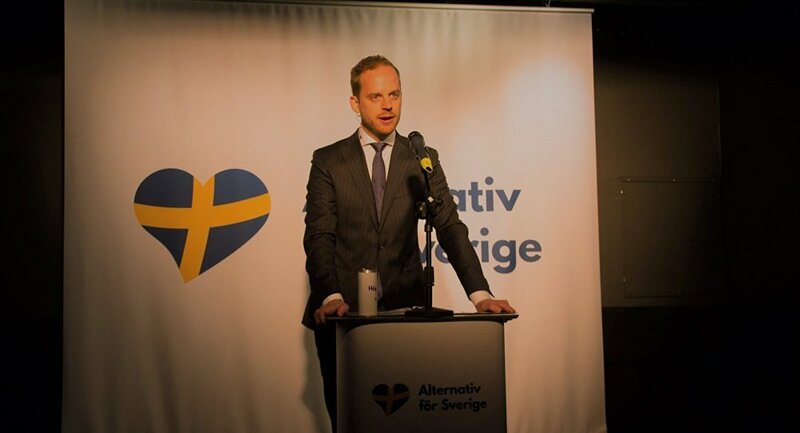 Last week, Mikael Jansson became the third Sweden Democrat MP to leave his old party for the newly created Alternative for Sweden and the first heavyweight to do so. ​While SD remains by far the most popular right-wing party in Sweden, many of their faithful voters have recently voiced concerns that their party has "mellowed out" to gain more acceptance. In 2014, four Swedish opposition parties concluded a so-called "December agreement" with the "red-green" government on preventing SD from gaining power. Although the "cordon sanitaire" has since been formally scrapped, it remains in place in unwritten form. By its own admission, AfS has gained 1,200 members in the course of three weeks in March alone. Sweden has taken in over 200,000 asylum seekers since the onslaught of the migrant crisis. The share of Swedish citizens with foreign background has been rising steadily in the past decades, having effectively surpassed 25 percent.